OK, I'll admit it: I'm a bit of a fan of Catherine Ryan Howard. Catherine is one of self-publishing's success stories and that success has come about through her being clever, nice, strategic and a very engaging writer. I think her attitude to the whole business is utterly professional and she is well worth listening to. I read and enjoyed her first highly successful memoir, Mousetrapped: A Year and A Bit in Orlando, Florida, and agree with her ruthless analysis of why it wasn't accepted by a trade publisher. I bought both the ebook and POD versions of her bible of self-publishing - Self-Printed: the Sane Person's Guide to Self-Publishing - and very much followed her strict (scarily so) instructions when I came to write and publish Tweet Right - The Sensible Person's Guide to Twitter. In fact, was there possibly some subconscious influence on that title?? But Catherine was on record as saying she would not self-publish a novel. And now, she has. So I dragged her here to explain herself. The Devil Wears Prada meets Weightwatchers and chick-lit meets corporate satire. Through their Ultimate Weight Loss Diet Solution Zone System, Slimmit International Global Incorporated claim they’re making the world a more attractive place one fatty at a time. Their slogans “Where You’re Fat and We Know It!” and “Where the Fat IS Your Fault!” are recognised around the globe, the counter in the lobby says five million slimmed and their share price is as high as their energy levels. But today the theft of their latest revolutionary product, Lipid Loser, will threaten to expose the real secret behind Slimmit’s success...The race is on to retrieve Lipid Loser and save Slimmit from total disaster. If their secrets get out, their competitors will put them out of business. If the government finds out, they’ll all go to jail. And if their clients find out… Well, as Slimmit’s Slimming Specialists know all too well, there’s only one thing worse than a hungry, sugar-crazed, carb addict – and that’s an angry one. Will the secret behind Slimmit’s success survive the day, or will their long-suffering slimmers finally discover the truth? Available now in paperback and e-book editions. NM: You self-published Mousetrapped because you recognised that (and why) a publisher wouldn't take it; you knew that although you could find readers who would like it, there would not be enough for a publisher to recover investment. Is the same true of Results Not Typical? NM: You said that you would never self-publish a novel. Why did you say that and why have you changed your mind, you naughty person? I said it because at the time, I believed non-fiction was the only genre that could really suffer from the “We Like It But There’s No Market For It” rejection. I mean, if your novel was good enough to be published they’d publish it, right? But publishing houses just don’t have as much money as they did before to take a chance on something new (if they ever had it) and if you’ve written something that doesn’t neatly fit into an existing genre, then it’s something new. Publishing is a business at the end of the day, and me and my book were extremely high risk. Too high risk. But I’m a business too – a self-publishing business. In March of this year, Mousetrapped had been on sale for a year and I’d managed to offload 4,000 copies of it. Up until that point I’d looked upon my self-publishing adventures as something to keep me in coffee grounds until some Fairy Editor-mother came along with a six-figure deal (hey, a girl can dream...), but I realised then it was time to start treating it like a serious business, like my actual career. I made two decisions: to write and release the sequel to Mousetrapped, a book called Backpacked, and to self-publish Results Not Typical. The editors who rejected it because they felt it wouldn’t do well in the Irish/UK market were undoubtedly right – they are the experts – but I don’t have to sell to any one territory. I can sell worldwide. Plus, I already have an established readership – I’m not starting from scratch – and there’s only a miniscule financial risk involved for me, relatively speaking, because I sell e-books and print-on-demand paperbacks. So for me, doing this is extremely low risk. 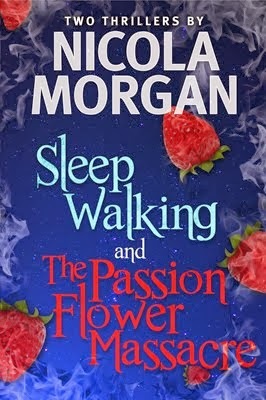 NM: Anyone who self-publishes has to spend huge amounts of time on marketing, no? And trust me, although published authors have to do stacks, too, you DO have to do more as a self-pubber. I know. So, how do you manage it and can you pass on some tips? I barely manage it, to be honest. [NM adds: thank you, thank you, thank you!] My computer is on almost as much as I’m awake. In the last few months I took a step back from Twitter, etc. so I could write Backpacked, and that is reflected in my sales. If you stop working, the books stop selling. I feel like I have some momentum now but still, I have to keep working at it. My advice would be to concentrate first on having a great “hub”. For me, that’s my blog. That’s always my number one priority and I put more time into it than anything else. If I have time, I’ll do things like Facebook, Twitter, etc. but I always make sure my blog is up to date and offering new, valuable content, no matter what my writing schedule is. I think if you do that, the whole online platform/book promotion/tweeting incessantly thing becomes infinitely more manageable. Blogging brings people to you, and that’s a whole lot easier than trying to go out there and find them. Having said that, I have absolutely no time for the whingers and moaners who are all, “I just want to write. I just want to concentrate on my craft. It’s all about the art for me, darhling. I don’t have time for Twitter...” etc. etc. Even if you sign a deal with a major publisher, you are going to have to promote your book – and rightly so. It’s like a certain young Hollywood actress who claims to hate publicity and only wants to make indie movies. How many movies no one goes to see because they don’t know they exist does she think she’s going to get to make, eh? NM: What have you learnt about writing since writing your first book? My favourite piece of writing advice has always been “Write the book you want to read” but what I’ve learned is that while doing that’s all well and good, you need to write the book you want to read that someone else might one day want to read too. Otherwise, there’s no point. With Mousetrapped, I definitely strayed into self-indulgence in places. I was enjoying writing about a certain thing or place, and I thought, Well, I like this and this is my book, so... but you have to re-write with the end reader in mind. If you don’t, you won’t have any. NM: What have you learnt about publishing since publishing your first book? I’m more convinced than ever that luck plays a huge part in success, whether it be traditional or self-publication. You can certainly “prime” yourself to receive luck by doing things like writing a good book, acting professionally at all times, doing a lot of online promotion, etc. etc., but there’s no sure-fire way to sell books. You can promote a book 24/7/365 and sell 50 copies, and you can sit back and do nothing and yet sell 5,000. All you can do is strive to make luck your only variable. Do everything you can and then wait as long as you can. As I type this I’ve sold around 8,500 self-published books, but I sold less than half of them – about 3,000 – in the first year (March 2010-March 2011) and only 500 of them in the first six months (March-September 2010). The first month I sold 62 copies. But I hung on, and I kept plugging away. Then, luck came. If I’d given up a few months in, I wouldn’t have be around to receive it. Oh, you’re good. You’re very good. I’m going to use that one myself in future! Well, I suppose since this is a blog tour to promote my new novel, Results Not Typical, any opportunity to plug Results Not Typical, subtly or otherwise, is fine by me, I’m going to pretend that I wished you’d asked me why I chose to write Results Not Typical, a book about an evil weight loss company. It’s because a) I’m still annoyed about a certain bestselling chick-lit title that had the protagonist banging on and on about “ballooning up to 10 stone”, b) I think the weight loss industry has been asking to be satirised for years and years and c) I, fortunately or unfortunately, have plenty of experience in that area, most recently with a scary cult-like organisation that forbade me from eating 99.9% of all foods and tried to convince me that decaf coffee was a worthwhile thing. I’m still overweight but, hey, I got a novel out of it, didn’t I? Results Not Typical on Amazon UK is here. Results Not Typical on Amazon US is here. Would you like a chance to win one? 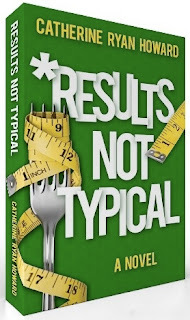 If you visit Goodreads here you can enter a giveaway to win one of five paperback copies of Results Not Typical. Open for entries from September 30th-October 31st. Open to all countries. People, if you plan to self-publish, please do read Self-Printed. And if you just want to curl up with a good piece of fiction, think Results Not Typical. Thank you, Catherine, and good luck with all your books. Fantastic interview. I, too, really admire Catherine and her sensible, professional approach. I've read 'Results Not Typical' and thoroughly enjoyed it. It's a wonderfully written novel that deserves many readers. What a treat - Crabbit Old Bat and Catherine Caffeinated talking together! I thoroughly enjoyed Self-Printed, not just for the strong voice and clear style but for the practicality and depth of the information. I feel I confident could self-publish just by following methodically through Catherine's book. Have now ordered 'Results Not Typical' (I hear Catherine shout "Result!"). I recently bought Self-Printed and it is about to save my sanity and help me to help a charity publish a book of really moving poetry for Christmas. Big thanks for the book, and for a really interesting interview. Thanks for this. I am currently working through Self-Printed, in an effort to stay sane and get a book out. And her logic for changing her mind and self-publishing this is interesting. Good luck with it, Catherine. Thanks everyone and thanks Nicola for having me! Hi all, thanks for this. Catherine has been a rock of strength for me through my self-printing journey (did I just say that? Yeuuch). It is a nightmare if you're not technically minded, old with teenage kids and working fulltime. But. I will have my launch, my little moment in the sun and hopefully it won't cost me too much! "All you can do is strive to make luck your only variable" -- well put! Excellent and informative interview Nicola and Catherine. I got my first novel self-published by YWO. My second novel 'Bombay Baby' by a brand new publisher due out next month. Writing is a pleasure, marketing is hard! I have read (or have purchased and am going to read shortly) all of Catherine's books. She's an amazing writer and has the best attitude about self-publishing I have come across. Well done. Really interesting interview. We can so easily fall into the trap that the soul we invest in our writing has to be lain at the feet of the all-knowing agent or publisher - tens of thousands of words dismissed with but a few (see http://tollesburytimeforever.blogspot.com/ for my own personal experience!!) So refreshing to hear from someone as cool and bright as Catherine! Top stuff! She just put the ice in my cider!! Thank you both! I will buy Catherine's books, and I needed this talk and information from both of you brilliant and generous ladies! Ah, Catherine, we all have a soul worth selling!!! Have to say that I really do agree with having to 'keep at it' marketingwise. Every book and or author is a business really. The book or author is something that needs to be 'sold' as an item or brand and as with any other product customers need to be reminded constantly that it exists.